Side chair with chrome steel wire frame and removable cushion in leather or fabric. Armchair with chrome steel wire frame and removable cushion in leather or fabric. BE04/05/BAR STOOL: Italian by birth and a sculptor, Harry Bertoia was a member of the Cranbrook Academy of Art. Some of the most famous designers of the twentieth century joined this important institute, including Eero Saarinen, Charles Eames, Ray Kaiser and Florence Schust Knoll. 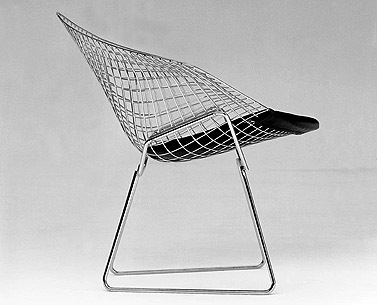 Bertoia was a teacher at the Cranbrook when Charles Eames was Head of the Department of Experimental Design. Inevitable was the exchange of mutual knowledge and influence, leading Bertoia to present his seats about a year after Eames’ chair with a metal wire structure. Although Bertoia made use of similar materials and techniques, his chairs attain to a plastic result completely different from that characterizing Eames’ chair. 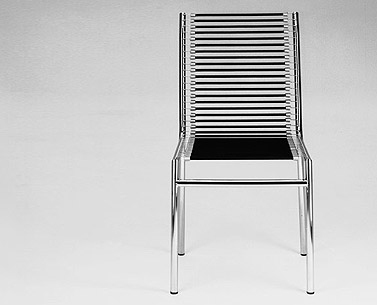 Side chair in chrome-plated tubular steel. Natural or black lacquered beechwood frame with woven cane insets. Arm chair with frame in chrome plated tubular steel. Seat and back of natural or black lacquered beechwood with machine-caned insets. Flat welded endcaps. BR04/05: Although it cannot be considered innovative in a narrow sense, this model is unquestionably Breuer’s work. During this same period, other designers were working on the continuous tubular cantilever chair, which gave rise to legal disputes around attribution. In a lawsuit filed in 1929 the German High Court awarded attribution to the Dutch designer Mart Stam. Breuer’s version with the beechwood seat and back was nevertheless a brilliant solution to the necessity for the structural stiffening of the frame. 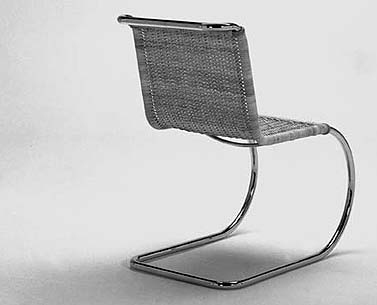 In the hemp or wicker versions designed by Mart Stam, Anton Lorenz and Mies, metal bars introduced under the seat and behind the back provided the strength to keep the legs separated. In the 1960’s, the chair was renamed "Cesca", as a tribute to his daughter Cheska. Lounge chair with frame in chrome plated steel tube. Seat, back and arms in colored saddle leather. Flat welded endcaps. In 1925 Marcel Breuer in collaboration with Karl Koerner, head smith of the Junkerswerken in Dessau, produced the first model of the curved tubular steel lounge chair better known as “Wassily” chair. Technical notes: autogenic welding of tubular structure in nickel-plated steel (the first experimental model consisted of iron tube) with 20 welding points; rigid metal structure on 4 legs with handcrafted production of several pieces to be jointed (with considerable waste of technological time); canvas covering. In 1926 the chair was disassembled again and the material was used for other experimental models. 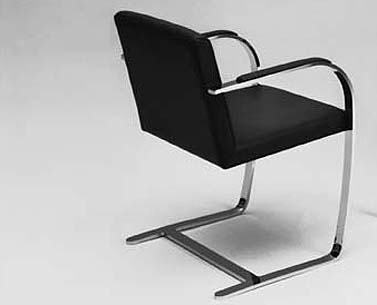 This model was produced at the beginning of 1926 in the Junkerswerken of Dessau with Marcel Breuer’s suggestions and is considered the prototype of the mass-produced “Wassily” chair. Technical notes: autogenic welding of tubular structure in nickel-plated steel with 14 welding points; metal structure on two legs; technologically realizable only by means of artisan techniques element by element; canvas covering, (subsequently replaced by Eisengarn covering). This unique model is at the Bauhaus in Dessau. This version produced at the Bauhaus is dated 1927. It presents some of the elements characteristic of the later model such as the continuity of the back’s tubular frame. We also notice a simplification of the covering system, whose assembly is made easier by using springs. At the same time Standard-Möbel in Berlin began mass-producing the chair. Technical notes: mass-production in industrial assembly line; drastic reduction of the number of welding points with the introduction of screw connections; for the first time the surfaces of seat and armrests adapted to the seat shape; Eisengarn covering; tubular frame in nickel-plated steel. The chair appears for the first time in the Weissenhofsiedlung of Stuttgart as a mass-produced model by Standard Moebel of Berlin (B4 Model). In 1928 as a result of Marcel Breuer’s resignation from the Standard-Möbel Company of Berlin, another variation of the “Wassily” chair was created as an alternative for Thonet. Technical notes: tubular frame in nickel-plated steel produced in assembly line; very similar to the third model except for the unique back (shape of a tubular upright in continuous steel). The original model had a covering in canvas straps. 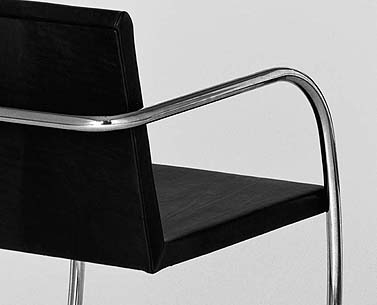 Breuer made a further modification for Thonet after Standard-Möbel was absorbed in 1929. Technical notes: further elaboration of the five new technical and assembly processes of 1928; improvement of sitting comfort by modifying the transverse uprights; Eisengarn covering; tubular frame in nickel-plated or chromium-plated steel. This first model of a chair in curved tubular steel designed by Breuer is generally held to be the first armchair with a metal structure. This despite the existence of a cantilever chair presented by Gerhard Stüttgen in 1923, and the patent granted in the United States in 1922 to Harry Nolan for the design of a tubular metal cantilever chair. The chair was renamed "Wassily" as a tribute to Wassily Kandinsky, for whose Bauhaus apartment it was allegedly designed. Armchair with chrome-plated tubular steel frame. Seat and back in hide in a variety of colors or cowhide. Arms in a continuous band of strap leather. This is the best-known version of the re-interpretation by Le Corbusier of the British “officer’s chair". It had previously been produced in the upholstered version, with flared armrests formed by leather straps stretched by springs, and this way it had been used in Villa Church’s interior, at Ville d'Avray. This version was produced by Heidi Weber in Zurich, who from 1959 re-interpreted Le Corbusier’s designs introducing some adaptations, in agreement with the designer, which fostered their industrialization. Swivel chair with tubular steel frame in epoxy enamel or polished chrome. Seat and back covered in expanded foam. Upholstery in leather or fabric. Swivel stool with tubular steel frame in epoxy enamel or polished chrome. Seat covered in expanded foam. Not removable covering in leather or fabric. CO15/16: Charlotte Perriand started designing furniture before her joining the Atelier of Le Corbusier. The swivel chair was for instance designed and manufactured in 1927. When Le Corbusier asked Pierre Jeanneret and Charlotte Perriand to share in the program for "domestic equipment" which contemplated the construction of the four prototypes designed by Le Corbusier (chaise longue, grand confort, petit confort, siège a basculant), Charlotte Perriand contributed to the general project with her swivel chair, her swivel stool and the T-beam table. Her designs were therefore presented with the four prototypes by Le Corbusier, and included in the Thonet catalogue as well. GR54: The chair is clearly visible in the photographs of Tempe à Pailla, the designer’s home in Castellar, in the south of France, where it was used in the lacquered version as a chair for the terrace. It is not certain whether it was conceived as part of the project for Villa E 1027 in Roquebrune that Eileen Gray designed with Jean Badovici between 1927 and 1929. It associated an extreme formal simplicity with a deep constructive complexity. Chair with chrome-plated tubular steel frame. Seat and back in hide. HE14/24/25: A pioneer in the use of simple industrial material for design furniture, Herbst developed with continuity the theme of the chair with seat and back made of elastic cords, similar to those used to tie up parcels. The first of many subsequent versions was presented at the Paris Salon d'Automne des Artistes Décorateurs in 1929, together with a version used as a high stool. René Herbst founded the company Etablissements René Herbst to produce and sell his projects. The version with high back and armrests follows the one without armrests. It appears in a photograph of the showroom furnished by Robert Lallemant, a ceramist and designer, in 1931. In 1937 a version was presented that maintained the elastic cords for the armrests, but they were replaced by woven cane in the seat and the back. Chair with chrome-plated tubular steel frame. Seat, back and arms in black elastic cords. Also available with lacquered frame. Armchair with chrome-plated tubular steel frame. Seat, back and arms in black elastic cords. Also available with lacquered frame. Stackable side chair with seat and back in continuous moulded beech plywood available in a variety of finishes. Leg structure in chrome-plated tubular steel. The most famous and ubiquitous chair designed by Arne Jacobsen is the result of one of his most fertile lines of research. It was designed three years after the "Ant” chair and at the same time as models such as the stacking chairs 3103, 3123 and the "Tongue". 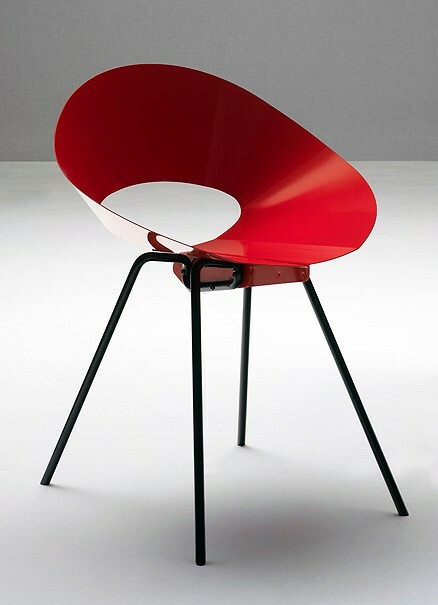 The formal search carried out by Jacobsen in the course of the years, along with an attempt at improving the comfort of his new chairs, inspired the author to elaborate on the idea of a frame in plywood and a base in tubular metal to other subsequent models: the "Grand Prix" in 1957 and the“Seagull” stacking chair, designed in 1969. Chair in curved steel and drawn steel wire legs; available in a various colours. Available with removable cushion in wool felt. KD04: Designed with the encouragement of his mentor, Eero Saarinen, Knorr’s project of the Side Chair was co-winner, with George Leowald from Germany, of the First Prize awarded by the Museum of Modern Art at the Low-cost Design Competition in 1948. The shell of the prototype presented at the competition was made with a thermo-bended plastic sheet. Knoll Associates started manufacturing Knorr’s chair in 1950, after introducing some changes to the original design, due to both technical and formal reasons. In order to reinforce the fastening of the sheet, the dimension of the stiffening rib was reduced and the legs were modified. The shape of the sheet itself was improved. The Chair was manufactured by Treitel Gratz, New York, between 1950 and 1952. Side chair with frame in black laquered ash. Seat in woven straw or upholstered in expanded foam covered in velvet, fabric or leather. This chair was designed to be used in different areas of the Willow Street Tea Rooms and probably represents the most “evolved” version of the stave-back chairs designed and produced by Mackintosh. The ladder-back design is characteristic of different chairs made by Mackintosh, from the one designed for David Gauld’s bedroom in 1893, to the one produced in 1901 for Windyhill, Kilmalcolm, both of which were more traditional in style. 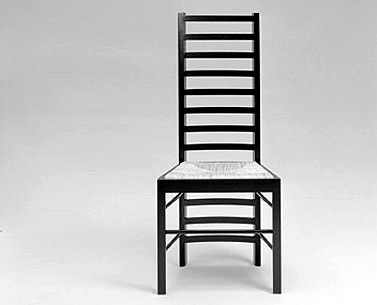 This new edition faithfully respects the original one designed for the Willow Street Tea Rooms, and does not include a modification which was added to all models after a certain period of use, the insertion of a reinforcement in the rear part of the chair’s back.This type of modification was made several times on Mackintosh’s furniture, which was often repaired, at times reinforced and in some cases reproduced without the designer being informed.In the case of this chair, no information exists documenting any involvement or authorization by the author for the subsequent modifications. Willow chair with frame in black lacquered ash. Removable cushion covered in velvet, fabric or leather. This “regal” seat was conceived as a chair for the manager of Miss Cranston’s Willow Tea Rooms in Glasgow. The seat was in such a position to visibly divide the space into two environments. The “graphic” motif of the small squares on the curved back is a stylised representation of a willow, which gives its name to the Tea Rooms. According to Nikolaus Pevsner, the Willow Tea Rooms represented "the European counterpart of Frank Lloyd Wright", making Mackintosh "one of the few genuine precursors of Le Corbusier". Armchair with frame in black lacquered ash. Seat upholstered in expanded foam covered in velvet, fabric or leather. This model, probably previously exhibited at the London Arts and Crafts Exhibition of 1899, was definitely shown at the Vienna Secession in 1900, where it was bought by Koloman Moser. The oval head of the back contained a decorative panel made by the designer’s wife, Margaret. A model without the decorative panel is in the collection of the Glasgow Art School. Chair with frame in black lacquered ash. Seat upholstered in expanded foam covered in velvet, fabric or leather. This chair was designed for Miss Cranston’s Tea Rooms in Ingram Street, Glasgow. The same chair would have been used the following year, in a lacquered version and with glass inserts, for the apartment in Mains Street. Side with tubular steel frame polished chrome. Seat and back in hand woven natural cane. Available also in pith. Armchair with tubular steel frame polished chrome. Seat and back in hand woven natural cane. Available also in pith. Side chair with tubular steel frame in polished chrome . Seat and back in hide in a variety of colors. This chair was designed for the master bedroom of Hill House, home of the publisher Walter W. Blackie, near Helensburgh in the Dunbartonshire area. The architectonic language of the building, where Mackintosh gave up all decorative elements of phytomorphous inspiration and was guided by a new functional and mathematical basis (Sypher), anticipates the themes of the research carried out at the Bauhaus. For this reason it is considered a proto-rationalist work. Chair with frame in black lacquered ash. Seat upholstered in expanded foam covered in velvet, fabric or leather. Back cm.106 high. This chair was the basic design used in the White Dining Room and in the Cloister Room of Miss Cranton's Tea Room in Ingram Street, Glasgow. Side chair with frame in black lacquered ash with mother of pearl inserts. Seat in woven straw or upholstered in expanded foam covered in velvet, fabric or leather. Armchair with frame in black lacquered ash with mother of pearl inserts. Seat in woven straw or upholstered in expanded foam covered in velvet, fabric or leather. This chair was designed for Miss Cranston’s Tea Rooms in Argyle Street, Glasgow. The high-backed chairs were placed around the tables in the centre of the room in order to create an intimate island. Although Mackintosh is unanimously considered one of the outstanding figures of Art Nouveau, in many aspects his work anticipates some themes of “modernism”. It is no coincidence that Nicolas Pevsner includes him in his "Pioneers of Modern Design" (1936). Wylie Sypher in his "From Rococo to Cubism" (1960) specifies how both rococo and art nouveau were movements within the decorative arts that were integrated into architecture as well. In Mackintosh’s interior designs, stylized lines and geometric forms reinforce an architectural dialog which from Art Nouveau onwards, with the progressive marginalisation of 19th century decorative syntax, mirrored the unification of interior design and architecture characterizing the modern movement. MI04/05/14/15: Exhibited for the first time with a leather back and seat at the Weißenhof in 1927, it was produced until 1930 by Berliner Metallgewerbe Joseph Müller, and from 1931 by Bamberg Metalwerkstätten, to which all the designs by Mies and Lily Reich were transferred. Within the same year, however, Mies stipulated a contract with Thonet Mundus of Zurich, which guaranteed the worldwide distribution of the products. The version with armrests of the model was exhibited at the Weißenhof in 1927. MI24/25: This model, lower and wider than the original version designed by Mies in 1927 (see mod. MI14), was shown for the first time at the Berlin Bau-Austellung in 1931. It was initially produced by Bamberg Metalwerkstätten. Side chair with frame in chrome plated tubular steel. Suspension in hide straps. Seat in expanded foam covered with leather. Armchair with chrome plated flat bar steel frame. Hardwood seat covered in expanded foam. The armchair was designed for the bedroom of Tugendhat house in Brno in 1930. It was initially produced by Berliner Metallgewerbe Joseph Müller, and from 1931 by Bamberg Metalwerkstätten. Armchair with tubular steel frame in polished chrome . Seat and back in hide in a variety of colors. Armchair with frame in chrome plated tubular steel. Suspension in hide straps. Seat in expanded foam covered with leather. Armchair with chrome plated tubular steel frame. Hardwood seat covered in expanded foam. 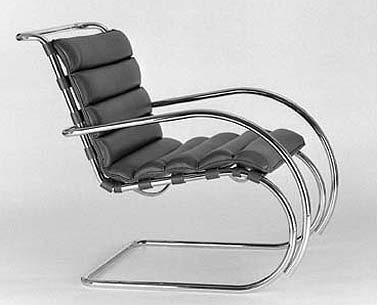 MI55: Between 1927 (the year of his first exhibitions at the Weißenhof) and 1930, Mies Van Der Rohe, with the collaboration of his friend Lily Reich, developed various prototypes of tubular steel cantilever chairs. At least one original tubular version is still existing, characterized by a more inclined seat and a wicker covering, which in 1930 gave the cue for the small armchair of the Tugendhat house’s dining-room in Brno. The characteristics of the one designed for the Tugendhat house were modified by Mies to adapt its comfort at the dining table. It was initially produced by Berliner Metallgewerbe Joseph Müller, and from 1931 by Bamberg Metalwerkstätten. Chair with solid natural ash frame. The "Zigzag" chair was designed by Rietveld in 1934 and was produced for some years by Metz & Company, Amsterdam. Lounge chair with frame in solid black and yellow lacquered beechwood. Seat and back in red and blue lacquered plywood. Originally conceived and produced in 1918 in wood with a natural finish, the colored lacquer version of this armchair appeared for the first time in 1923. Pedestal swivel chair with black or white bright lacquered cast aluminium base. Seat and back in resin. Cushion in expanded foam covered with fabric or leather. Pedestal swivel armchair with black or white bright lacquered cast aluminium base. Seat and back in resin. Cushion in expanded foam covered with fabric or leather. 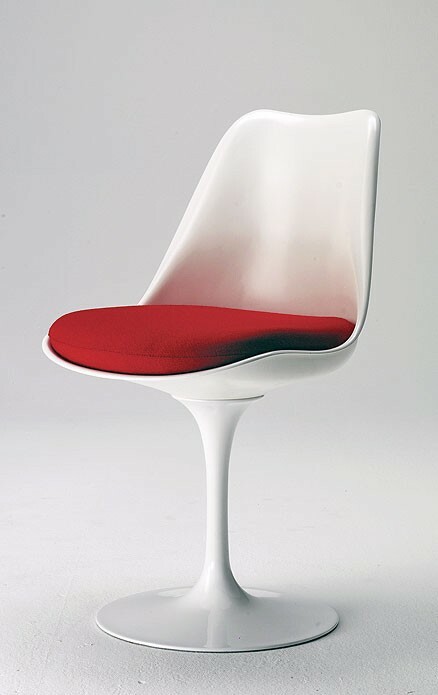 SA04/05: The chair represents the peak of Saarinen’s research on "organic furniture" started in the early forties with the exhibition of the "organic design in home furnishing collection", a competition announced by MOMA, in which Saarinen participated with Charles Eames. Saarinen aimed at two targets: on one side he meant to bring formal order back to the inside of what the author considered the "sea of legs" within the inhabited space; "the framework bases of chairs and tables present in a typical interior produce an unpleasant, confused and restless atmosphere. I wanted to clear it of the sea of legs. I wanted the chairs to be a sole object again. All the greatest objects of the past, from the chair of Tutankamen to that of Thomas Chippendale have always been characterized by a structural "unicum"; on the other side Saarinen wanted to give formal and constructive unicity back to the product. "With all our excitation for frames in plywood and plastic, we have lost part of this organicity. The way in which today it is realized, the "pedestal furniture" is made of half plastic and half metal. In perspective, I am watching at the moment in which the plastic industry will reach such a level to let the chair, like planned, be realized in a single material "
Side chair with chrome-plated tubular steel frame. Seat, back and arms in hide in a variety of colors. Armchair with chrome plated tubular steel frame. Seat, back and arms in hide in a variety of colors. ST44: Designed in 1926, it went into production the following year. 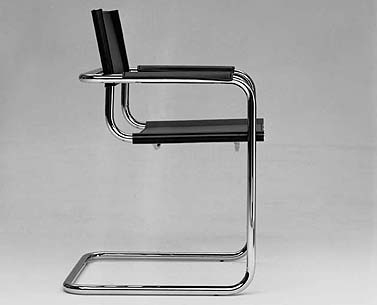 It is similar to a chair attributed to Breuer, present in the 1927-1928 Thonet catalogue. 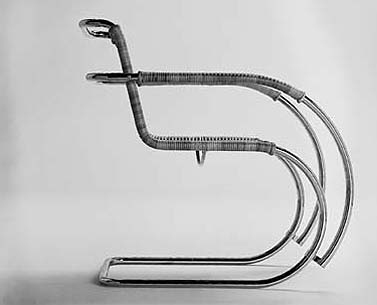 In the original version, the chair had a stiffening bar between the front legs, which in Breuer’s and in all subsequent productions was replaced by a curved element under the seat. Already in 1923, Gerhard Stüttgen, a teacher at the Cologne School of Art, presented a cantilever chair, produced with a cold-drawn Mannesman tube, within an exhibition of the school’s works, although the design did not cause any sensation. The design made by Stam, who was presumably not informed of that first proposal, went far beyond the pure application of the technical possibilities offered by a Mannesman tube, since he investigated the linguistic and formal applications deriving from the suspended structure, which allowed him to develop the theme of rotating planes. Indeed, his first prototypes, perhaps as a consequence of his lacking knowledge of the more recent innovations offered by the steel industry, used grey hot-molded tubular steel and threaded angular joints. It was not until 1926, when he was invited by Mies to take part in the exhibition of the Stuttgart Weißenhof-Siedlung, that probably he was informed of the working methods and tools used in Bauhaus laboratories. 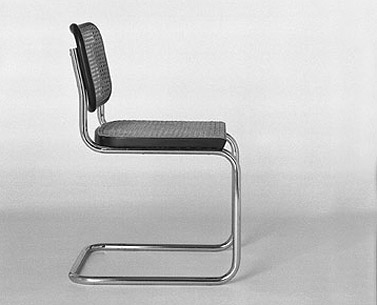 A few weeks after the presentation of Stam’s chair, Mies also presented his version of the “cantilever” chair at the Stuttgarter Weißenhof-Siedlung. 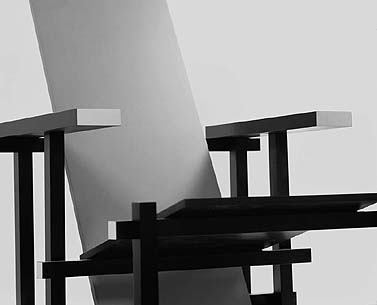 Mart Stam was awarded the authorship of the idea of the cantilever chair by the German court. ST65: Based on designs by Mart Stam and Marcel Breuer. This model comes from the designs by Mart Stam and Marcel Breuer respectively for Standard Mobel and Thonet. The continuous tube which shapes both the base and the armrests also keeps the vertical tubes of the back spaced apart and rigid, allowing the elimination of the separation bar present in the original models. Stackable side chair with frame in epoxy enamel tubular steel in a variey of colors. Seat is epoxy enameled sheet metal. Barrel chair in solid cherrywood with back fillets. Available walnut or black painted. Seat upholstered in expanded foam covered with fabric or leather. 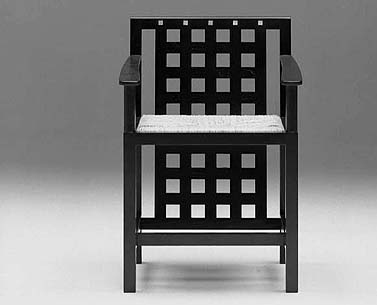 This chair was designed for the "Wingspread" house, planned for Herbert Johnson in 1937. It is considered a more evolved version of a project for a barrel-shaped chair originally designed by Wright for Darwin D. Martin’s house in 1904. Chair in solid cherrywood with back fillets. Available walnut or black stained. Seat upholstered with expanded foam covered with fabric or leather. This chair was designed for the Avery Coonley house in Riverside, Illinois in two heights, with medium and low back, in order to emphasize the hierarchical roles of the people seated around the table. For this project, Wright designed all the components of the building, including built-in and movable furnishings.